Evelyn Waugh was an English author whose life and career spanned much of the 20th century. His literary contribution to modern culture is immense – memorable novels, insightful travel writing, perceptive journalism – but his greatest legacy is that he wrote stylish prose. 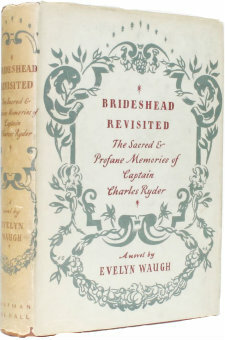 He put down biting satire in Decline and Fall, Vile Bodies and A Handful of Dust, wrote elegantly about World War II in his Sword of Honour trilogy of novels (Men at Arms, Officers and Gentlemen and Unconditional Surrender) and managed to single-handedly create nostalgia for the fading British nobility in Brideshead Revisited. The 1938 Evelyn Waugh novel Scoop has been widely celebrated for its critical, satirical flaying of the pitfalls of the journalism industry of the day. Like so many other authors who wrote on either side of World War II, Waugh (1903-1966) led a fascinating life. He started out as a school teacher but was bored and quickly turned to writing. His first wife was also called Evelyn (she was the EHV-uh-lyn to his EAVE-uh-lyn). He converted to Catholicism in 1930. He travelled the globe extensively as a nomadic journalist during the 1930s. Waugh (full name at birth: Arthur Evelyn St. John Waugh) fought, rather unsuccessfully, in World War II. Brideshead Revisited, written while recovering from a broken leg suffered in a parachute training accident, brought him fame and fortune. He had a mental breakdown in 1953 but his experiences still inspired a novel - The Ordeal of Gilbert Pinfold. Towards the end of his life, he suffered from ill health and a lack of funds. Evelyn Waugh had strong opinions, ranging from the merits of Catholicism to the merits of the British class system. He wrote a fine book about wine – Wine in Peace and War – that is now highly collectible. First editions of Evelyn Waugh novels, especially those still with dustjackets, are also extremely collectible, as are many other Evelyn Waugh books. A large number of books have been written about Waugh, who continues to provoke discussion decades after his death. At War with Waugh by William Deedes, Evelyn Waugh A Biography by Selina Hastings and Mad World: Evelyn Waugh and the Secrets of Brideshead are all worth a look. There are many varying opinions about Waugh himself, whose personality seemed to polarize people, but the biographers all agree about the high quality of his writing. Which Evelyn Waugh Books Have You Read?